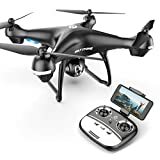 Best Holy Stone Drones 2019 – reviews of the top holy stone drones for sale in 2019. Find out which Holy Stone Brand camera drones are best. As drones become more and more commonplace as a form of entertainment for adults and children alike, the technology and prices have changed dramatically. Manufacturers are competing to come up with something new and different as prices drop, making the drones more accessible to the masses. Certain brands, however, do stand apart from the rest as superior in quality and function. Holy Stone is one such brand that is said to regularly release new drones that are ideal for entry-level flyers as well as those with some experience. 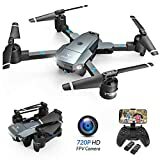 The multiple speed modes and the fact that the majority of all Holy Stone drones have a camera on them make them a popular choice for consumers. Read on to find out just what makes the Holy Stone brand stand out, as well as the top 7 Holy Stone drones. The Holy Stone HS200D RC drone features a 720p camera with 120-degree FOV live video capabilities. This WiFi quadcopter is the ideal entry-level drone for beginners and children. The camera is very advanced and can be removed easily. The HD features allows users to capture images with their iPhone or Android device. Thanks to the FPV real-time transmission and its wide angle, this Holy Stone drone is capable of FPV streaming live video easily and effectively. It provides users with an additional perspective on the world from above. The ‘Altitude Hold’ feature is a user-friendly way for pilots, young and old, to perfect their flying skills and hone their control. After the throttle is released, the drone will hover at a selected height; this is also a very handy feature when it comes to snapping crystal-clear images. The ‘Headless Mode’ functions when the flyer cannot see the drone but ensures the drone remains in the direction of the user. These factors make the Holy Stone HS200D ideal for beginners: headless mode, modular battery, camera design, far-distance control range of 100 meters, 10-minute flight time, powerful battery, 6-axis gyro tech for stability, and durable plastic construction. For $110, this feature-rich Holy Stone drone is worth every penny. 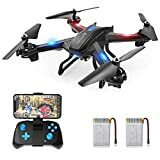 The Holy Stone HS170 Predator Mini is an RC helicopter drone that is another excellent choice for beginners seeking some drone training and is generally regarded as one of the best starter drones on the market. 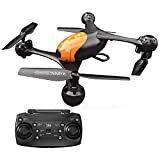 Ideal for beginners but also very enjoyable to fly for experts, this Holy Stone drone is well suited for outdoor, indoor, and nighttime flying. Although its transmission range is not the best, it is highly responsive and stable. It also has 3 adjustable speed modes for flying. Its ‘Headless Mode’ setting is ideal for beginners so they can concentrate on the flying, rather than the drone’s orientation. It is capable of performing some fun flips, and its 6-axis gyro gives the drone stability. While this drone is low on the spectrum when it comes to extensive features, for what it is, a beginner drone, it is one of the favorites to be released over recent years. For $40, the drone offers its users some fun tricks, a flying time of 6-to-8 minutes, a flying range of 30-to-50 meters, and a battery charge time of 60-to-80 minutes. 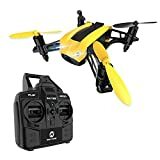 The Holy Stone HS150 Bee mini drone is an eye-catching black and yellow, and measuring 5″ in both length and width, it is highly portable. Its size and speed make it the go-to drone for many flyers wanting to hone their craft. The drone features 5 speed modes with the capability of reaching up to 50km/h. This tiny drone is known for its agility, speed, and user-friendly controls. While it is not as feature rich as many drones on the market, the Holy Stone Bolt Bee mini drone is a blast to fly, ideally for indoors and in tight spaces. This is another drone ideal for beginners and experts alike. With the 2 high-powered batteries it comes with, your flight time of 5-to-7 minutes is doubled. Its flying distance ranks in at 50-to-70 meters, and the battery charge time is 90 minutes. For $46, this is one of the most popular and accessible Holy Stone drones on the market. The Holy Stone HS200W packs quite a feature punch. It boasts impressive specs like a low charge time, a 9-minute flying time, and a wide transmission range at almost 120 meters. The camera quality is mid-range; it is a 20-megapixel camera capable of 720p quality. What it lacks in amazing image-capturing capabilities, it makes up for with its FPV WiFi capability, headless mode, altitude-hold mode, and gravity sensor. The headless mode is ideal for beginners who won’t have to worry over the drone’s orientation while they master the controls. The altitude-hold mode is fantastic for taking pictures and capturing video that is crystal clear and not shaky; this feature enables the drone to hover at a certain height. This Holy Stone drone also allows flyers to control the drone with their smartphone; the gravity sensor aligns with the device so flight can be controlled through the maneuvering of the phone. It also has an impressive one-key return function that will bring the drone back to you in moments. Although the camera quality is not the best with the Holy Stone HS200W, with a flight time of 7-to-9 minutes, a flying range of 120 meters, and a battery-charge time of 60 minutes, it does offer a number of impressive and user-friendly features. The Holy Stone HS700 FPV drone is one of the higher-end Holy Stone drones to hit the market. With a 1080p camera with live video, the GPS ‘return home’ feature, this RC quadcopter is the ultimate for adults wanting to learn the art of drone flying and image capturing. It also features a brushless motor, ‘follow me’ feature, 5G WiFi transmission, and is compatible with a GoPro camera for extra fun with video and image capturing. First off, the 1080p FHD camera is quite impressive. Its 110-degree field of view lens allows for recording that memorable moment in a panoramic view. Real-time video selfies are enabled by the 5G 1300FT transmission. The GPS assisted flight feature means that the drone can hover and automatically return to its pilot when the signal is lost or the battery charge is getting low. The drone can follow its pilot or fly in a circle along a pre-set path. It has one of the higher flight times around at 20 minutes, thanks to the powerful battery. With its low-power alert, pilots can enjoy their flight without having to worry about where their drone is or when the battery gets too low to return home. The brushless motor produces a powerful drone that runs quietly and rarely breaks down. This Holy Stone drone is easy to control with a quick launch feature of pressing one key. The Holy Stone HS700 FPV drone is an impressive piece of drone technology. 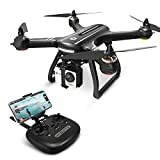 At $330, it is an investment for those wanting to fly their drone without monitoring its status or location as its features do that for them. With its stable flight control and headless mode, pilots can focus on capturing those amazing panoramic shots and video it was designed for. The Holy Stone HS100G drone feature a 1080p FHDF camera with 5G FPV live-video capabilities. Its GPS ‘return home’ function makes it the ideal beginner RC quadcopter for beginner kids and adults. The ‘follow me’ function and ‘altitude hold’ make it a cinch to fly, control, and monitor. The 1080p FHD camera features a 120-degree field of view lens with a 90-degree adjustable angle for capturing every worthy aerial moment you see. The 5G FPV WiFi transmission allows the pilot to see exactly what the drone sees; this removes the worry of crashing, as well as being able to capture the ultimate in clear video feed from as far as 1,600 feet away. The GPS ‘return home’ feature relies on GPS positioning to prevent drone loss. When the drone loses its signal or its battery gets low, it will automatically return home. This safety feature allows flyers to enjoy their flight time, rather than worrying about monitoring the drone’s location, battery strength, and proximity to objects. This drone is quite simply a blast to fly. The headless mode and altitude-hold function make it extremely user-friendly and ideal for capturing crystal-clear images and video. The one-key take off and landing function make this Holy Stone drone perfect for beginners or kids. The ‘follow me’ mode enables the drone to follow the pilot and capture images, videos, or dronies, with the pilot’s every move. For $280, the Holy Stone HS100G drone is sure to impress and exceed any and all expectations. 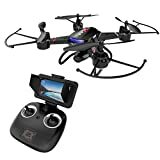 The Holy Stone F181G drone features an impressive camera and 5.8G FPV live video that is ideal for kids and adults just entering the world of drone flying. This quadcopter features an HD LCD transmitter, altitude hold, 3D flip headless mode, and a modular battery. The 5.8G high-frequency transmission allows for first-person viewing and live video on an LCD screen. This Holy Stone drone is compatible with VR headsets for those wanting to enter the exciting world of drone racing. The 720p FPV camera has a 120-degree field of view lens capable of capturing the highest in quality images and video. It is also ideal for the growing trend of capturing dronies. The 120-degree viewfinder allows for a panoramic view for recording, which is why this drone is regarded as one of the best camera drones in its price range. Thanks to the powerful modular battery, this drone offers a longer flight time of 10 minutes. With a low-power alert, the drone is simple to monitor. The ‘altitude hold’ function allows the drone to hover stably for capturing crystal-clear images and video. The ‘headless mode’ makes it simple to control the drone’s flying direction, and the control could not be easier to use. 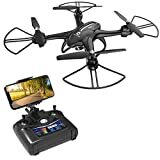 For $150, this Holy Stone F181G drone would make the perfect gift for anyone interested in drone flying and image capturing. 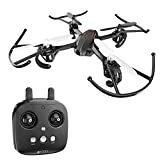 Its impressive features like one-key start and landing, emergency stop function, 3D flips and tricks, multiple speeds, and high-quality panoramic camera make it one of the best drones available in its price range. Holy Stone enjoys the reputation of releasing some of the most reliable and user-friendly drones on the market. Consumers report that their Holy Stone drones rarely malfunction and that the Holy Stone customer-service team is vastly superior to other companies. One thing that people seem to really like about the Holy Stone drones is that they are all around the same size. Brands like Syma release every kind of drone and size conceivable, but Holy Stone drones all seem to run in the mid-sized range. The average-sized drone bodies also feature a sleek and modern design that is as pleasing to the eye as it is functional. The Holy Stone drones are also thought to be extremely versatile as they come with multiple speed modes that satisfy beginners and experts alike; some of the Holy Stone quadcopters come with five speed modes accounting for numerous flying styles and pilot abilities. 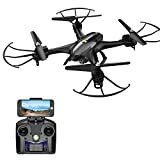 When it comes to Holy Stone drone selection tips, fortunately, the brand carries a huge variety when it comes to style, functionality, and price range. If it is an entry-level drone you are looking for, the Holy Stone brand is an excellent place to start. The majority of their drones feature multiple speed settings, making it ideal for both beginners and experts. From small to high-end, the pricing of Holy Stone drones can range from $30 to $300, with the mid-range of drone prices capping off at around $150. Compared to other drone brands on the market, Holy Stone has earned an impressive reputation for reliability and superior customer service. Drones for Sale Review by Best Drones Inc is the leading online supplier of quadcopter drones. Discover which drones are the highest rated by users via our online comparison guides. Drones for Sale Review has been in the drone business for over 10 years, far exceeding our competitors. If you need expertise in selecting the right drones, you have come to the right place. Feel free to reach out via our Contact Us page, if you need help selecting a drone or purchasing directly using our online store.